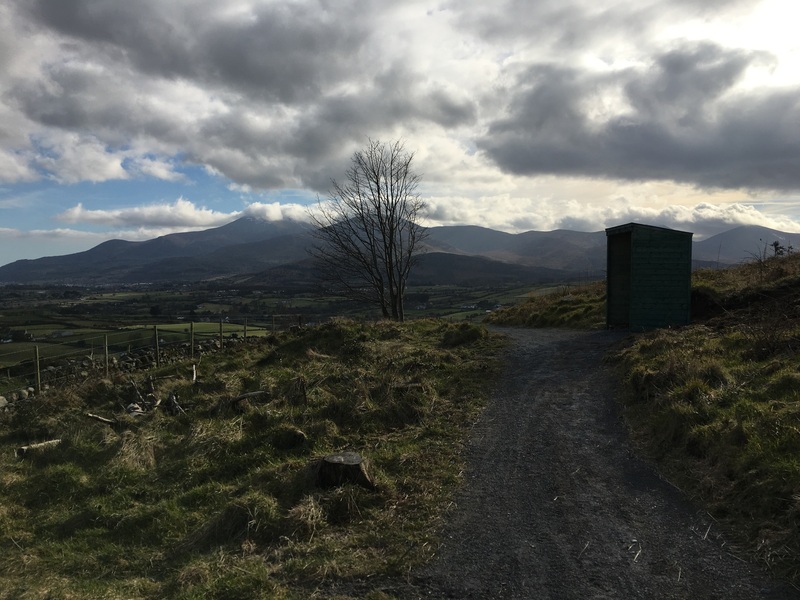 Further enhancements have been made to Bunkers Hill in Castlewellan to improve disabled access and provide shelters along the multi-use trail. Bunkers Hill which opened in November 2014, entails a 2 kilometre multi-use walk and family cycling trail along with an innovative play trail designed to encourage young people to enjoy outdoor adventure in a safe environment. The trails which offer outstanding views of Slieve Croob, Dundrum Bay and the Mourne Mountains have proved very popular with both locals and visitors alike. “The local community has really embraced this project helping the Mourne Forests Recreation Officer to plant wildflowers, collect litter and host a community barbeque attracting 250 people during last August’s Festival of Flight” added Councillor Ruane. The recent improvements include resurfacing of the laneway leading to a new two disabled car parking space, accessible through a gate with a coded lock. The multi-use trails have also been enhanced by providing two wooden shelters at key view points along with the installation of dog waste bins. Those wishing to access the disabled parking space can do so by contacting Newry, Mourne and Down District Council on 03000 132 233 to obtain the access code. The recent upgrades were led by Outdoor Recreation Northern Ireland following a Community Consultation Event. The project was funded by the legacy Down District Council. “It is pleasing to deliver this project as one of Outdoor Recreation NI’s final actions of our management role for Mourne Forests. It provides great satisfaction to be able to deliver on an action specifically requested by the local community and leave a positive legacy.” explained Boyd McClurg, Mourne Forests Recreation Officer whose role will cease at the end of March. “I would personally like to thank all the members of the local community who aided me in my role and proactively providing feedback on the recreation facilities.” added Boyd. Improvement work has been carried out by local contractors R.Fee Contracts. As per the original project, the improvements have been delivered by Outdoor Recreation Northern Ireland in partnership with Newry, Mourne and Down District Council and Forest Service Northern Ireland.